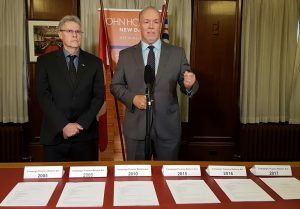 VICTORIA— In the wake of embarrassing international media attention and renewed calls from across the province, John Horgan is challenging Christy Clark to finally end B.C.’s disgraceful system of unlimited political donations. Analysis of B.C. Liberal 2016 fundraising data indicates that just 1.5% of B.C. Liberal donors account for half of the more than $12 million raised by the B.C. Liberals last year. These top 185 donors ponied-up an average of $37,000 each to fill Christy Clark’s campaign coffers. Horgan will be introducing a bill to ban corporate and union donations at the beginning of the spring session of the legislature. A ban could be in place well before the election – all that’s missing is a “yes” from Christy Clark.